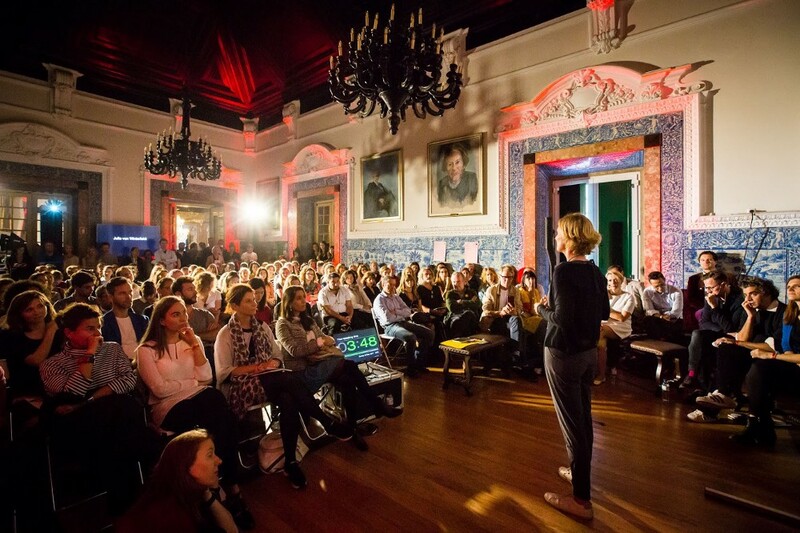 Tim and The Business Romantic Society are hosting the third House of Beautiful Business on November 3–8, 2018 in Lisbon. “In order to enter the room, you must hum a tune. 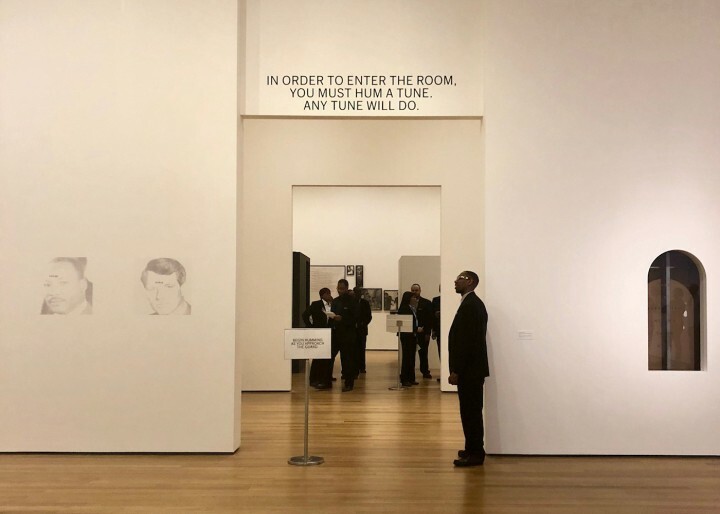 Any tune will do,” is written on the wall at the entrance of Adrian Piper’s recent show at the Museum of Modern Art in New York. Priya Parker, the author of the new book The Art of Gathering, pointed out on her Instagram feed that the purpose of the prompt was to “carry you over the threshold of the gathering by inviting you to change your state of being as you walk through. In this case, to go from a non-humming state to a humming state as you enter a room. And still gives you enough choice to feel that you still have agency over what to hum.” The statement on the wall signaled to visitors that they were stepping into a new space by entering the exhibition. The old self stayed at the door, so a new one could emerge. The humming was an initiation ritual and marked the show as a liminal space, a moment of transition between two different states of being. Priya will be one of 300 participants in the House of Beautiful Business on November 3–8 this year in Lisbon. In fact, the House will kick off on Saturday, November 3 with Priya’s masterclass on the art of gathering — it will be a version of humming, our own special initiation ritual. 1) Society: What enables prosperity and social equity? 2) Organizations: How do we effectively collaborate as humans and with machines to create value? 3) Humans: Who are we and how do we belong? For six days, the House will be one big liminal space, a yet-to-be-defined territory between the old and the new, between a tired belief in big-tech-utopia and a vision for a humanist marriage of technology, business, and society. This new vision is desperately needed. The business of business is no longer just business: no longer shareholder value, no longer stakeholder value, not even the triple bottom line — the business of business is now humanity. As we are facing exponential change, hybrid and fluid identities, AI and automation challenging human agency, and some Silicon Valley tech icons spreading the gospel of “transhumanism,” we need a radical humanization of business. We must develop new mindsets and capacities, new narratives, organizations, and policies. We can do so by expanding the playing-field and drawing from those disciplines long neglected by management (biology, arts, humanities, etc.). It is paramount that we advance technology and our understanding of objective reality, while also refining our grasp of subjective reality, our inner truths. We need a new moral, aesthetical, and sentimental education, augmented by artificial, or extended, intelligence, but not replaced by it. The bottom line is this: As machines take our jobs and do them more efficiently, the most important work for us humans is the kind of work that must be done beautifully — with empathy, imagination, and love. With the House, we hope to create moments and encounters that enable insight and inspiration, paving the way for what we believe will serve as a new, much needed paradigm for our economies and societies: beautiful business. the constant transformation of our selves. Beautiful business is not only more human, it is also better business: the Millennials and Gen Z generations are looking for values-aligned and purpose-driven companies; customers desire genuine, authentic interactions; and innovation requires the capacity to imagine new worlds. Soft skills are the new hard skills, and being human is the ultimate differentiator when everybody else just maximizes and optimizes. At the House of Beautiful Business, we aim to develop theoretical concepts and practical recommendations for all these aspects, and to create an environment that invites participants to walk the talk and not just to discuss but also feel and live a more human brand of doing business. The inaugural House took place in February 2017 in an old guild house in Barcelona as an unofficial satellite event to Mobile World Congress. 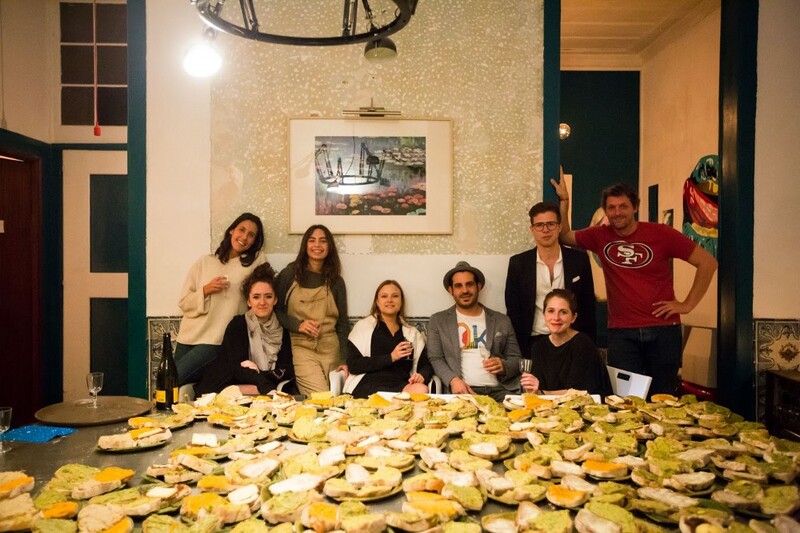 We then moved the gathering to Lisbon in November 2017 and produced a scaled-up second edition of the House in Lisbon during Web Summit, the world’s largest technology conference. Both Houses, by design, formed a stark contrast to the hustle-and-bustle transactional nature of the other major conventions taking place in the same city — but a world away. This year, the House of Beautiful Business will take place in two locations in Lisbon’s central Sao Bento district: the Dear Lisbon Gallery House, a vintage boutique hotel that will be redesigned into an all-day event and co-working space from Saturday through Friday, as well in the 18th century Academy of Sciences, which will serve as the venue for the Conference of Beautiful Business on Sunday, November 4. As a special add-on on Friday, November 9, in collaboration with our partner Galp, we will also produce the Un-Known Summit, designed to examine new models and practices for learning in a time of exponential change with a select group of global HR, development, and education leaders. Some of the more than 75 speakers and performers at the House this year. They will mingle with 300 fellow participants at the House, as well as actors-in-residence; musicians-in-residence, an AI-in-residence, and a chef-in-residence. The program is a week-long immersive mix of talks, debates, philosophical salons, social experiments, masterclasses, performances, and hands-on work sessions. Each evening from 9:30 pm to midnight, we will host a salon devoted to a different theme: from Major Desires, Minor Keys: Melancholia and Sadness as Productive Forces in Business (Saturday) to Closer to You: The Future of Intimacy (Monday), Night of the Revolution: Big Ideas for Big Changes(Tuesday), Warm Data: Making It Human Again (Wednesday), and the Grand Finale including a Silent Farewell Party on Thursday. And tucked in between, on Sunday, we’ll present the comprehensive Conference of Beautiful Business with talks and an overload of inspiration on the New Superpowers, Exponential Beauty, Play, and Identity, covering topics from brainhacking to supersonic planes to the AI-based reskilling of workers, followed by a courtyard gala at the Academy of Sciences. Experiences in the House will include VR movie screenings; a music recording studio; an actor’s studio; a photo lab hosted by legendary Magnum Photos; a 360 degree feedback room; work streams on the humanist token economy, beautiful AI, warm data, the future of food, gender and identity, and the art and science of change, as well as ethnographic excursions, breakfast conversations, afternoon debates, nightcaps, and specially themed dinners; musical jam sessions, and even a soccer/football game coached by management thinkers. 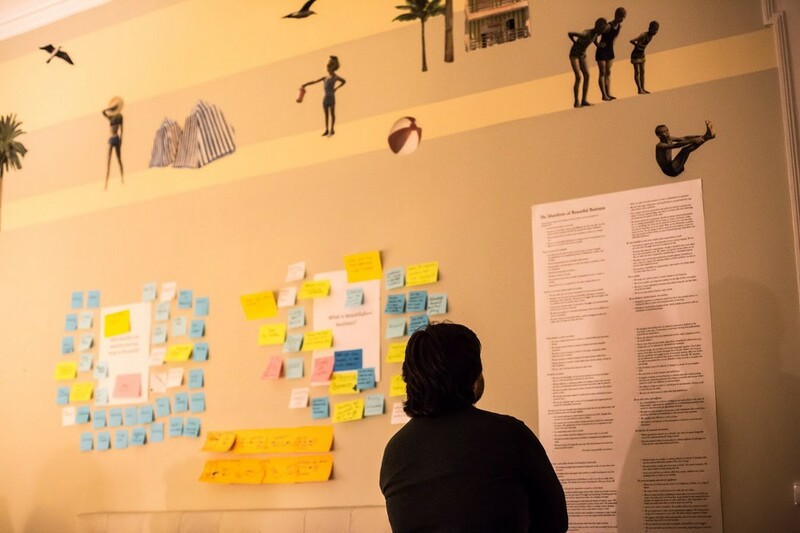 In addition, participants will be able to take part in the Museum of Beautiful Business, an open-ended art studio designed by the Berlin-based collective Artistic Intelligence; mindfulness and social presencing theater; in-depth conversations with business leaders; and masterclasses on “emotional agility” (Susan David) or “scaling quality” (Airbnb). Of course, they may also simply hang out in our co-working space, on-site café, or listening room, and work or relax alone or with others. We were blown away by the response to the two Houses we’ve already held, and it showed us that there is a great desire not only for the humanization of business, but also for exploring this topic at human scale and in an intimate setting that is kind, warm, and playful; an environment that makes our hearts sing and leaves us wanting more. This video featuring the Song of Beautiful Business, composed and performed by the 2017 House residents, captures it perfectly. We have increased capacity this year, but we’re keen on honoring our design principles. The House mixes the tradition of art and literary salons with the entrepreneurial energy of startup offices and co-working spaces, and links carefully designed social encounters with the features of an interactive, theatrical performance. The six-day experience is designed to push participants outside their comfort zones, ever so gently, to create a space of surprise and revelation. We seek to engage the full diversity of humanity, the full person (left/right brain, mind/body/soul) as well as multiple disciplines, especially those that business has neglected over the past few decades (arts, humanities, biology, psychology). Moreover, we want to create a safe space for participants to bring the boldest, truest, most vulnerable versions of their selves, regardless of status, role, or affiliation. To that end, we mix social and exponential technology, ancient wisdom and modern memes, rituals and best practices. Whether it is the role of melancholia in management, the lessons innovators can draw from soccer, or how biology can help solve acute business challenges, we strive to connect the seemingly unrelated and celebrate the grey space between binary truths. And most importantly, we want to deliver practical value and actionable insights that participants can take back to their organizations, helping them make the case that their business will be more successful if it’s more beautiful. Every vision is a place, as our board member, the psychologist and leadership professor Gianpiero Petriglieri reminded us recently. So is the House — but it’s also a place for creating visions, a place of beauty that is not afraid of tackling ugly truths while celebrating our essential humanity, a platform for big and small ideas that have the potential to radically redefine the meanings and workings of business. One of this year’s residents wrote to us saying how surprised she was “that such a place exists.” We can’t wait to bring it to life together. The House of Beautiful Business will take place on November 3–8, 2018 in Lisbon. There are only a few passes left, and you can request an invitation here. In the meantime, follow the House on Twitter, Facebook, LinkedIn, or Instagram, read the Journal of Beautiful Business, and/or subscribe to our monthly email newsletter, the Beautiful Business Letter.